If you use the incorrect account number or routing number your tax refund will be returned to the IRS which will cause it to be delayed for weeks or even months. 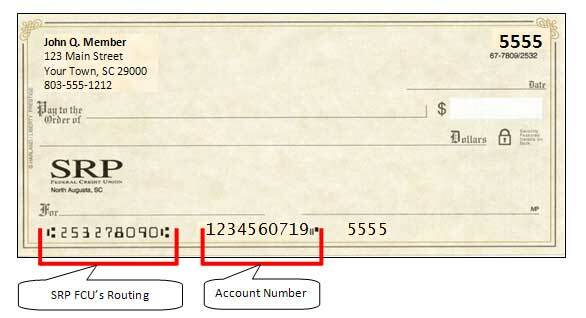 Do you want to receive your tax refund automatically to your checking or savings account? If so, it is very important that you provide the correct routing and transit number and the correct account number to the IRS. DO NOT use the account number information on your statement, Dashboard or Account page in your home banking product or your member identification card. These numbers DO NOT meet specific criteria as established by the electronic payment system. • Log on to SRP Online, click on the account description (Checking, Savings, etc.) to view the history screen for that account. Then click "Account Details" and the account number that should be provided to set up electronic debits or credits is displayed as the “ACH number”. The routing transit number is 253278090. • Visit a Member Service Representative at any branch or call us for assistance at 803-278-4851. Please note for security purposes we may not be able to verify your identity over the phone and therefore unable to provide the information you request.